During the past 2 years many crypto index funds emerged as a result of the increased interest in the crypto market. These products offer to their investors a basket of cryptocurrencies under the promise of higher risk-adjusted returns due to portfolio diversification. In this research article we show how this is actually far from the truth. We find in fact that cryptocurrencies are highly correlated, offering no portfolio diversification benefit by investing in a basket of them. 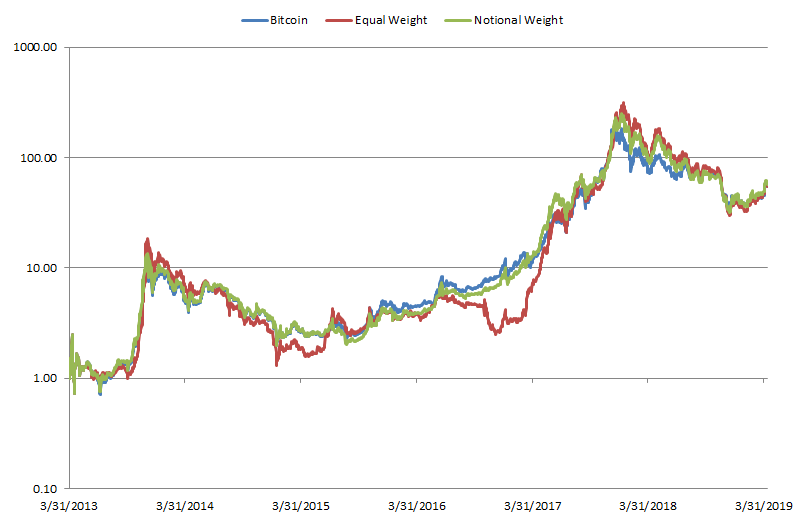 In particular, we find that the performance of Bitcoin and an equal weighted or notional weighted crypto basket portfolio is essentially the same during the analyzed period. Therefore, investors looking for an actively managed product in the crypto space should look at other options, such as a systematic crypto investment program. What is a Crypto Index Fund? Equal weighted: each cryptocurrency is assigned the same amount of capital. This method may not be feasible to include a high number of cryptocurrencies, since many of them have very low liquidity and the portfolio may incur too high transaction costs for rebalancing as a result. Notional weighted: the portfolio constituents are weighted by their traded notional. This method is has the ability to also include cryptocurrencies with low traded volume, since they receive a lower weight in the portfolio. Market cap weighted: this method assigns weights proportional to the market cap of each cryptocurrency. Similarly to the notional weighted method, it may be suitable to include low volume cryptocurrencies since they usually have also a low market cap. The main benefits that could potentially be achieved in a basket of cryptocurrencies is portfolio diversification if the constituents are uncorrelated. On the other hand, an investor usually has to pay higher costs compared to a direct investment in cryptocurrencies. These expenses include transaction costs to rebalance periodically and management and sometimes performance fees to the sponsor of the crypto fund index. In the next section we see if it is worth paying these higher costs analyzing the correlation in the major cryptocurrencies constituents of such portfolios. Usually proponents of crypto index funds cite portfolio diversification as the main factor in considering an investment in their product. Based on Modern Portfolio Theory, an investor can achieve benefits from portfolio diversification if he invests in a basket of uncorrelated or inversely correlated products. 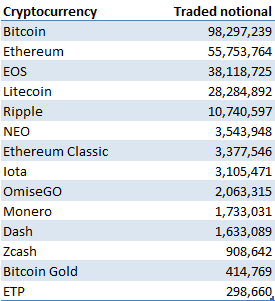 In this analysis we consider the top 14 cryptocurrencies by traded notional on Bitfinex as of April 13, 2019. The period covered goes from March 2013 to April 2019. Table 1 shows the top 14 cryptocurrencies by traded notional considered in this analysis. Figure 1 shows the average rolling correlation among the considered cryptocurrencies. 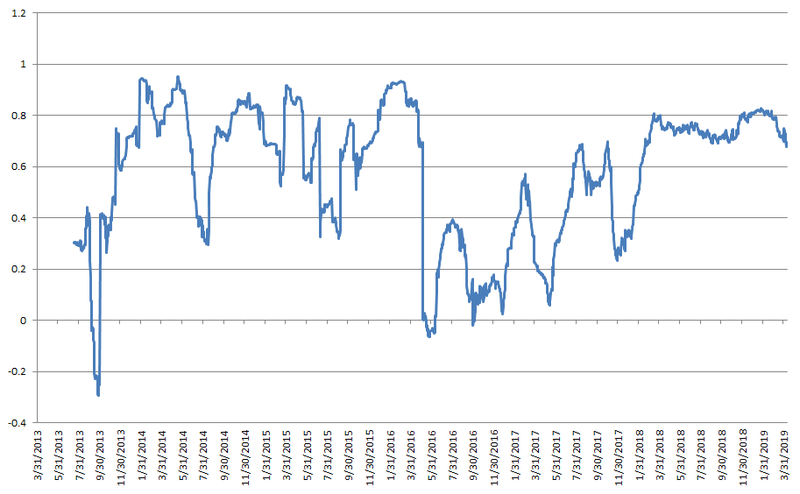 As it can be seen from it, cryptocurrencies are highly correlated, with an average correlation of 0.7 as of April 2019. This poses in question the potential benefit that can be achieved through portfolio diversification by investing in a basket of cryptocurrencies through a crypto index fund. The next section will analyze if this is true by comparing the performance of one cryptocurrency, Bitcoin, to a crypto basket and see if they are similar. Figure 2 shows on a log scale the hypothetical performance of 2 crypto index funds, equal weighted and notional weighted, compared to a passive investment in Bitcoin. The figures for the crypto funds are gross of transaction costs and fees charged by the sponsor. The performance of the crypto fund indices will be actually lower after considering them. As the figure shows, the performances of the 3 portfolios are very similar. Table 2 shows the performance stats of the 3 portfolios to compare them in a more rigorous way. As the Table show, they all have similar levels of returns, volatility, and Sharpe ratio accordingly. Table 3 displays the correlation matrix between the 3 portfolios. As we would have expected from our previous correlation analysis on cryptocurrencies, the 3 portfolios are highly correlated (ρ = 0.9), posing in serious doubt the validity of an investment into crypto index funds. As we have seen from the previous data, crypto index funds cannot provide any benefit compared to a passive investment in Bitcoin. Therefore, an investor looking for an actively managed product in the crypto space should consider other options. An example is a systematic crypto hedge fund, which could potentially deliver alpha and an uncorrelated performance compared to Bitcoin and other cryptocurrencies in both bull and bear market conditions. Cryptocurrencies are highly correlated: the average correlation among cryptocurrencies in the analyzed period is about 0.7. This poses a problem for an investor trying to gain portfolio diversification benefits by investing in a crypto index fund or basket of cryptocurrencies. Crypto index funds have almost the same performance compared to a passive investment in Bitcoin: as we have shown in our analysis, the performance of 2 hypothetical crypto index portfolios before any cost is almost identical to a passive investment in Bitcoin. Investors looking for an active product in the crypto space should consider other options: the previous conclusions suggest that an investor who wants to have an allocation in the crypto space may want to consider other products. One option is a systematic crypto hedge fund, which could potentially provide alpha and uncorrelated returns compared to a passive investment in Bitcoin in both bull and bear market conditions.